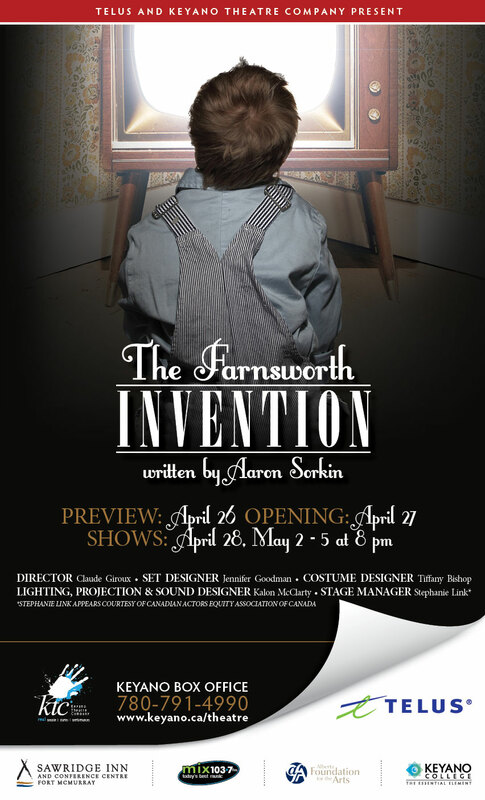 As we've been working on The Farnsworth Invention in the rehearsal hall, with the outline of the set taped out on the floor, Keyano Theatre Company crew members have been hard at work on deck (and above deck) getting everything ready for our first time on-stage which happened last night. The technical director (TD, Nick Beach) pours over schedules that include light hangs and focusing, floor painting, set installation, and the hanging of multiple set pieces on to pipes that fly way up in the air beyond the sight lines of the audience with the absolute mission to have everything ready to accept the actors on the appointed night. We begin our time in the main theatre with the requisite safety speech delivered by the TD. In some ways this is very similar to the mandatory performance we get every time we step into an airplane. 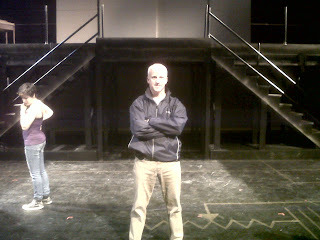 The fundamental difference is that the safety speech in the theatre is somewhat sacred and inspires complete attention. The gathered thespians hear about the intricacies of the set and its potential hazards, evacuation procedures in the event of an emergency, and several other critical pieces of direction. Just before setting off on a stop and start work through, we are taken on a walking tour of the two story set that include two staircases that move about the stage. "It is absolutely critical that when these stairs get set in place that this button gets pressed," said the stage manager, Steph Link, warning of the dangers of what an unsecured set of stairs would do if someone stepped on them unawares. It would pretty much go zooming across the stage, potentially sending the person at the top flying to the stage floor 8 or 9 feet below. The technology is incredible. One press of a button and the massive stair unit gets locked into place. One more press instantly makes it able to be moved effortlessly. Last night was all about getting familiar with the nuances of the set and how to move ourselves and furniture from place to place in the time required to be ready for our next cue line. All of a sudden, this ensemble cast of 21 was dealing with new obstructions, traffic lanes and myriad curtains - legs (narrow black drapes that sit parallel to the front of the stage) and Germans (narrow black drapes that sit perpendicular to the front of the stage), both masking the limited amount of space in the wings. We made it through act one and took a paperless stab (you'll find out what this means when you see the show) at the stock market scene at the top of act two before calling it a night at the stroke of 11 pm. It made for a long day, but it is easy to see the path that we are on as we hit cue-to-cue (more on that in a couple of days) on Friday and Saturday before moving into the dress rehearsal phase in anticipation of the preview performance on Thursday of next week, incredibly only one week away.